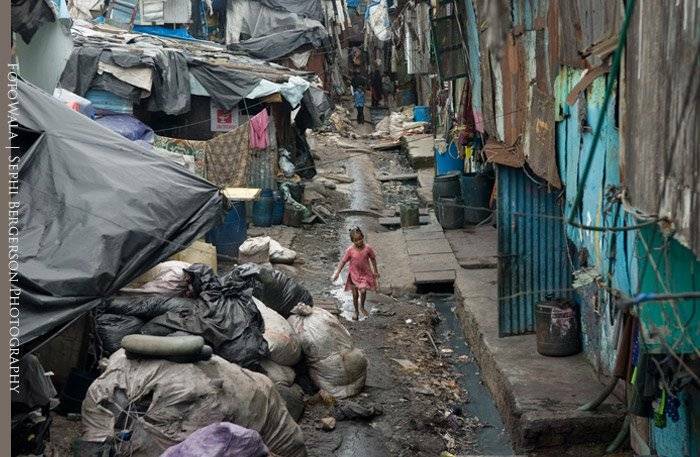 Asia’s largest slum, Dharavi, lies on prime property right in the middle of India’s financial capital, Mumbai (Bombay). It is home to more than a million people. Many are second-generation residents, whose parents moved in years ago. A city within a city, it is one unending stretch of narrow dirty lanes, open sewers and cramped huts. In a city where house rents are among the highest in the world, Dharavi provides a cheap and affordable option to those who move to Mumbai to earn their living. As Dharavi is located between Mumbai’s two main suburban rail lines, most people find it convenient for work. Dharavi also has a large number of thriving small-scale industries that produce embroidered garments, export quality leather goods, pottery and plastic. Most of these products are made in tiny manufacturing units spread across the slum and are sold in domestic as well as international markets. The annual turnover of business here is estimated to be more than $650m (£350m) a year.